That's right, yesterday, due to the civil and delightful sharing of my buddy Chris, I saw The Book of Mormon, live on stage in Denver's little Broadway, the DCPA. I entered this show with high expectations, largely fueled by the generally exceptionally high opinion of the show shared by reviewers and fellow viewers. I was only partially, like less than partially cloudy, more like scarcely, disappointed. The performance, which hits all the usual South Park marks of swearing, satire, well-meaning-but-misguided-people-doing-something-absurd-and-offensive, and careful jokes about AIDS, is enjoyable throughout, and/but, it also fills a traditional musical role easily and somewhat un-daringly. 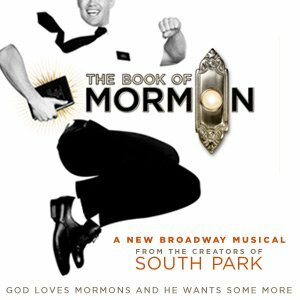 It is limited by its medium, and by the stage and time-constraints, but The Book of Mormon doesn't challenge "the musical" the way one might expect from Trey Parker and Matt Stone. In a season in which I've seen The Addams Family musical and Bring It On! the musical, The Book of Mormon doesn't feel radically different. It differentiates itself primarily on the dialogue and lyrics, but that's where the challenge seems most to end. The songs are good, but not great, and the traditional musical style compositions/standards tone breaks only for two excellent scenes: The "Spooky Mormon Hell Dream" which rocks out to show not only some hilarious contrasts in what Hell could be and the Hell Mormons conceive of, but also to demonstrate that an electric guitar solo is probably the most religiously threatening musical act man can create; and "Joseph Smith American Moses" wherein a play-within-the-play occurs (likening The Book of Mormon immediately to Hamlet) and the cast plays themselves playing themselves catering to a visiting Mormon leader. Otherwise, the songs are very traditionally "musical," which is by no means a bad thing, but considering Parker and Stone's history of bringing similar music to South Park, there was part of me that expected them to push it a little more, to be more clearly self-aware of singing, or the obvious narrative structure. There's also some epic allusions to the nerdiest of pop culture references, especially well done because they make allusions to different (vague as not to spoil) behaviors themselves. The dreamy, voice-over fueled opening sequences that set the stage with a little historical information on Mormonism was great. They satirical challenge of missionary work, spreading religion to foreign lands, and racism were potent and well-created. But the play felt unbalanced, and perhaps this is just a complication with the medium that I'm now noticing, in that the first half was both more challenging to the standard form and slower in pace, while the second half was expeditious and less daring (aside, of course, from the "Spooky Mormon Hell Dream".) It's not laugh-all-the-time-until-you-cry-and-ejaculate funny, but it is exceptionally well done. As an introduction to Broadway and theater, it is palatable for all people familiar with, but not addicted to, South Park. Perhaps that means Parker and Stone's next play will push the limits further, as they've demonstrated with the show. If they do, the lines for that play will be longer and even more rabid.